William Dawson came to Western Australia on the Nile in 1858. Unfortunately no Army service documents are extant for this man; presumably his service was too short-lived to qualify for a pension. In fact, William’s pay for January 1858 shows that his service was less than five years. This Pay List also indicates that he was a mason by trade and that his pay packet for the month was £2 0s. ½p. (1). The paucity of documentation therefore gives us no insight into his origins or marital status. The only clue to his birth date is his age at death (45) recorded in 1877 (2). I made an attempt to find a William Dawson born c. 1832 in the 1851 Census of England & Wales. If I have interpreted the Pay List correctly, the 19 year-old was not in the Army in 1851. 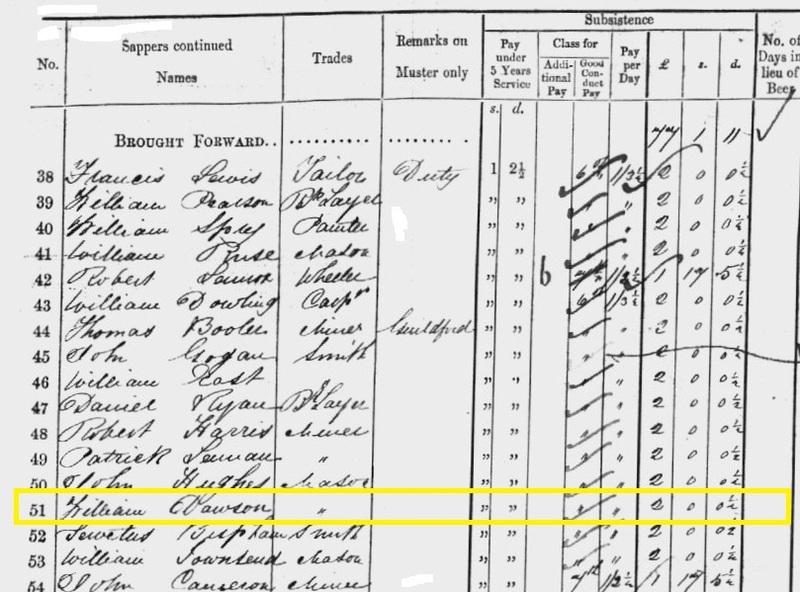 After filtering the census database for date of birth and using the keyword ‘mason’, I discovered three young masons in the time frame 1830-1834. They were sons of stone masons from Yorkshire and Westmoreland; I do not think that any would have abandoned the family business to join the Army, but who knows? Dawson is listed on the 20th Company RSM Musters until his discharge on 31 Dec 1861 (3). 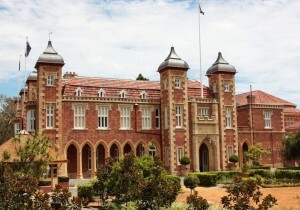 He appears to have been working on the ‘new’ Government House in the year before his discharge (4). The foundation stone for the building was laid in March 1859 and, after a blow-out of more than twice its original budget, it was completed in 1864 (5). That William Dawson took his Army discharge in Western Australia is in no doubt. His name is on the Remittance Ticket List issued on 14 Apr 1862 to the 26 men in the 20th Company discharged in Western Australia and handed by Frederick P Barlee, Colonial Secretary to Lieutenant Colonel Bruce, Commandant in Charge of Troops, Western Australia, in Executive Council the following day (6). The ticket entitled the men to a remission of £10 in the purchase of waste lands of the Crown in Western Australia, the title deeds of such land purchased not to be issued until a period of two years had elapsed since their discharge from the Royal Engineers, until which date they must have resided in the Colony of Western Australia. Whether William ever applied for or received his remission of £10 requires further research. 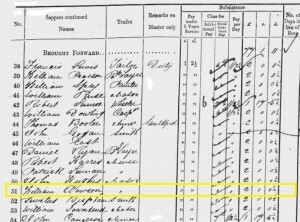 A man named William Dawson is cited as being in Bunbury in 1865/1866 employing two ticket of leave men (7). William Dawson died of Phthisis (Tuburculosis) on 2 May 1877 in the Colonial Hospital in Perth and was buried the following day in East Perth Cemetery. 1. Muster Rolls & Pay Lists January 1858 [WO11-158]. 2. Index to Registry of Births, Deaths and Marriages in WA. 3. Muster Rolls & Pay Lists Oct – Dec 1861 [WO-199]. 4. Warders and Gaolers Dictionary, p.51, David J Barker. 5. History of Government House website. Photograph by Derek Graham. 6. Colonial Secretary’s Inwards Correspondence 1862 [CSR 499-15]. 7. The Bicentennial Dictionary of Western Australia, p.791, Rica Erickson. 8. East Perth Cemeteries website.